ASUS has expanded its Zen AiO lineup of all-in-one PCs for 2017 with new 27” models. The company’s largest AIOs will fit into the current lineup of Intel Kaby Lake-based systems and offer bigger displays and higher performance than models featuring 22” and 24” screens due to desktop-class CPUs being installed. ASUS introduced its first AIO PCs with 22” and 24” monitors at Computex 2015 nearly two years ago. Since then the company has been gradually expanding its lineup of all-in-one desktop computers: first, it introduced more affordable Vivo AiO systems, and then it launched ASUS PRO AIOs for business users. Earlier this year the company began to add premium models into the Zen AiO family, targeting consumers who need better screens and/or higher performance. Back in January ASUS announced its Zen AiO Pro Z240IE, that is based on Intel’s 35W quad-core CPUs and 4K displays. 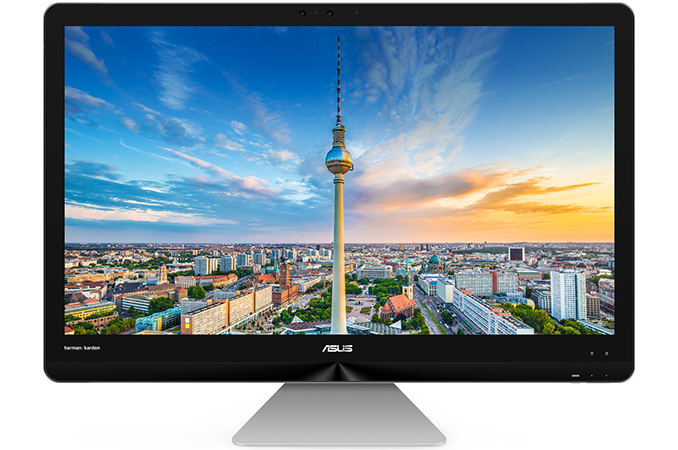 In late March, ASUS added the Zen AiO ZN270IE into the lineup with a bigger 27” FHD display. Just like the premium models introduced in January, the ASUS Zen AiO ZN270IE is based on Intel’s Core i7-T processors. However, similarities with the Zen AiO Pro Z240IE seem to end here. The Zen AiO ZN270IE comes with NVIDIA’s low-end GeForce 940MX GPU with 2 GB of DRAM (cheap versions of the ZN270IE use Intel’s iGPU, but this particular dGPU is barely faster than modern iGPUs), from 4 to 16 GB of DDR4 memory, up to a 512 GB SSD as well as 1 or 2 TB HDD storage, 802.11ac, a GbE controller and so on. The PC is equipped with an audio sub-system featuring four 3W speakers co-developed with harman/kardon, a 1 MP webcam (a premium version features Intel’s RealSense camera array with RGB and IR sensors), six USB Type-A ports, an SD/MMC card reader as well as HDMI connectors. It is noteworthy that while ASUS now offers AIO PCs with 27” displays (some models will feature 10-point multi-touch, some will not), for now they still feature FHD resolution (1920×1080). Over time we may see more advanced 27” AIOs with higher-resolution screens and further performance enhancements, like Apple does with its iMac systems. ASUS has not announced recommended prices for its Zen AiO ZN270IE PCs, but since the company intends to offer multiple versions of the product, they will naturally vary significantly depending on the retailer/local distribution.